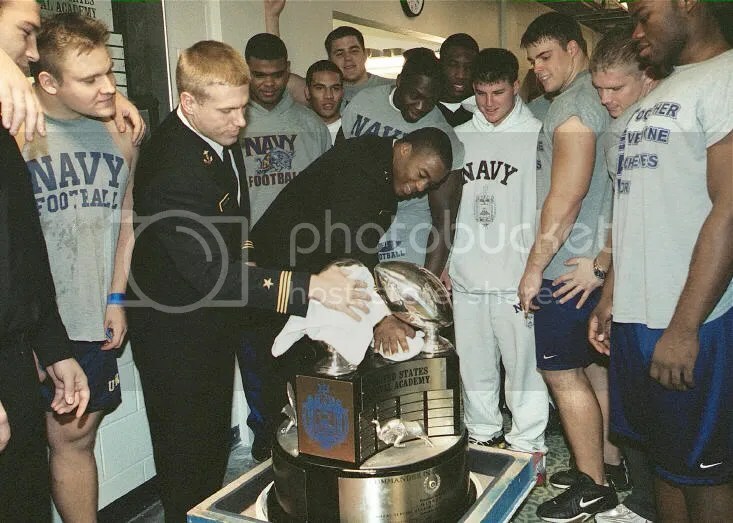 The trophy has remained in Annapolis ever since. Keeping it there is the football program’s top priority, but not because of rivalries or bragging rights or any other chest-thumping hoopla. The reason is much more matter-of-fact: it is important because the other service academies are Navy’s primary competition in just about everything. These are the schools that are most like USNA. They are who the coaches recruit against. The competition between them is the only apples-to-apples gauge for how the program is doing. After holding on to the trophy for seven years, it’s safe to say that the Navy program is doing pretty well. The road to making it eight years begins Saturday when Navy goes to Colorado Springs to take on Air Force once again. I like to think that I know enough about college football that I don’t get surprised by too much anymore, but I have to admit that I’m a little bit bewildered at how quickly people are jumping onto the Air Force bandwagon. Don’t get me wrong; they’re leading the nation in rushing, and their defense has also performed well. They’re off to a 3-1 start, including their first win over BYU since that ’03 season. They turned a few heads when they kept things close against a top-10 Oklahoma team. Air Force is a good football team. But are they that good? As heavily as they’re favored, it almost seems like it’s a foregone conclusion that Air Force is not only the better team, but should win the game fairly easily. This one of those times where perception might not match reality. Yes, Air Force is 3-1, but some of those performances don’t look as great now as they did at the time. They beat the snot out of Northwestern State, and they didn’t even look good doing it, going into halftime with only a 24-21 lead over what might be the worst scholarship team in all of Division I. The win over BYU was an important step for Air Force, setting them up for a top 3 finish in the Mountain West for the first time since 2007; but with the Cougars sitting at 1-3 after losing to Nevada at home, it’s apparent that they just aren’t very good. Air Force gave Oklahoma a good game, but so did Utah State and a rebuilding Cincinnati team. Last week, the Falcons had to snap out of a first half daze before pulling ahead of 1-3 Wyoming, 20-14. Sure, Air Force is 3-1, but are they any better than they’ve been the last few years? Perhaps, but I don’t think we’re seeing anything out of them so far this year that we haven’t seen in the recent past. Conversely, the general consensus on Navy is that they’re struggling. The Maryland loss really popped everyone’s balloon right off the bat; since Navy wasn’t going to meet the inflated expectations placed on them in the offseason, they were going to come off as a disappointment no matter what they did afterwards. The Georgia Southern game wasn’t exactly a work of art anyway, at least offensively, and a week later the Mids found themselves trailing at halftime to Louisiana Tech. Maybe that isn’t the most impressive résumé, but take another look. It’s Navy, not Air Force, coming into the game with the nation’s 11th-ranked defense. Two weeks after the Mids held Georgia Southern’s spread option to 73 rushing yards, the Eagles ran for 379 yards and beat the #10 team in I-AA, 38-21. Georgia Southern is now ranked #19 in I-AA. Navy’s offense put up 485 yards of offense against Maryland and 516 yards against Louisiana Tech. Both of those are more than Air Force has put up in any game against teams not named Northwestern State. Ricky Dobbs made some costly errors in the Maryland game, but against Louisiana Tech he carried the team, throwing for a career-high 219 yards. This is “struggling?” Hardly. Sometimes there’s no accounting for perception. Navy is being badly underestimated coming into this game. While the teams are fairly evenly matched, I don’t expect a repeat of last year’s 16-13 grind. Both teams have made improvements on the offensive side of the ball since then, and both have developed a couple of holes in their defensive armor that should allow for a few more points being scored in the game. Sandwiched in between those games, though, was a dominating performance against Georgia Southern that becomes a little more impressive with each passing week as the Eagles keep winning. GSU isn’t as good as Air Force, but they do run an option offense that is somewhat similar. Another encouraging sign for the Navy defense is that they played their best half of football in the second half of the Louisiana Tech game, holding the Bulldogs scoreless while forcing 3 turnovers and limiting them to only 67 total yards. It’s progress, but against a team like Air Force that thrives on the option and misdirection, the linebackers can’t afford to come out of the gates making those same mistakes. The fullback dive off of toss sweep motion would also work here. Offensively, both teams are a lot different from the last time they met. Tim Jefferson: For Air Force, the biggest difference has been the play of quarterback Tim Jefferson. Coming into the game last season, Air Force’s offense was terrible. The main reason for this was Jefferson’s inexperience; like the younger quarterbacks at Navy, he had a hard time adjusting to his reads in the option. As a result, Air Force was actually running very few triple option plays. They ran a lot of double option and misdirection plays with predetermined ball carriers, and the offense sputtered. As the season progressed, so did Jefferson. Air Force was able to incorporate more option back into the offense, and scored 30 or more points in 4 of their last 5 games. The Falcons had to replace all 5 starting offensive linemen coming into 2010, but thanks to Jefferson’s improvement, the offense has picked up where it left off. Jared Tew: The biggest beneficiary of Jefferson’s developing option mastery has been fullback Jared Tew. Fullback has never been quite as heavily utilized in the Air Force offense as it has been at Navy, but that’s changing. Tew’s 970 rushing yards last season were the most by an Air Force fullback since 1989; 505 of them came in the last 5 games of the season as the option was reincorporated into the offense. Tew ran for 136 yards and a touchdown last week to pace the team. Vince Murray: Murray came into last year’s game in relief of an injured Alex Teich, but did not play particularly well. He had a habit of running into defenders instead of around them. Two weeks later, SMU tried similar defensive tactics as Air Force. Murray responded with 141 yards and 2 TDs, and kept it up the rest of the season, finishing with 971 yards. Murray is a much different player than when he stepped onto the field against Air Force last year. No-Huddle: The no-huddle offense was used against both Maryland and Louisiana Tech with great success, but Air Force hasn’t seen it from Navy yet. Navy’s offense will also get a boost from the return of starting tackle Matt Molloy. Last year, the Air Force defense did everything it could to take away the pitch and force Navy to run inside towards the strength of the Air Force defense in nose tackle Ben Garland. I suspect that Air Force will do the same thing this year, but it will be hard to be as successful without Garland’s exceptional play. I expect to see a lot of midline option out of Coach Jasper, which should play to Ricky’s strengths. The key to the game for the Navy offense will be to force the Air Force secondary to play run support. Last year, Air Force’s front seven effectively handled the Navy running game, allowing the safeties to stay deep to avoid being fooled by play action. If the secondary has to get involved in stopping the option, though, that opens up other opportunities and expands the playbook. As much pressure as Navy has to win this game, Air Force has more. They’re the ones who have lost 7 straight. They’re the ones playing in front of the home crowd. They’re the heavy favorites, being told by just about everyone that this is the year they finally pull it off. They’re the ones getting the national attention and top 25 votes. They’re the ones making a spectacle by pulling out special-edition uniforms. Imagine the reaction if they don’t win. For Troy Calhoun, there is even more pressure. This is supposed to be the year it all comes together for him. Air Force’s regular season record has actually gotten worse each year he’s been there; they were 9-3 in 2007, 8-4 in 2008, and 7-5 last year. But now, he has his recruits. He has the upperclass leadership he said was so necessary when he took the job. He also just finished basically throwing the entire Air Force athletic department under the bus over being more competitive in the Mountain West. How much of a jackass will he look like if he says something like that, but still can’t beat Navy? This is a make-or-break season for him professionally, and without the Commander in Chief’s Trophy, it will be hard for him to consider it a success. Mike, as ever, well done. Thanks. Great analysis as usual. I have been looking forward to this game since the end of last season and think it will be the pivotal game of the season for both teams as it was last year. This will be like a spring game with both sides well prepared, and it will be decided by the kickers. Garland was a force last year, but this year AF’s strength is in their secondary. I think our perimeter and passing game will be challenged but I look for a big day from Ricky and the B backs between the tackles. Thanks, TDB. Great read. That last paragraph sums things up nicely. No matter how badly I want to crush them, the game is always too close for comfort. I age a lot during every AF and Army week, but AF gives me the gray hairs. Thankful that we won the last 7, Lets to keep it up! Thanks for the writeup, Mike. I think the no huddle is going to frustrate them honestly. As you point out it opens up RD to more playmaking. Funny how things(perceptions) have changed in a few short weeks. From possibly going 12-0 to a 10 point under dog. Ten point underdogs?!? Air Force’s (and maybe Army’s) year? And then this…. Air Force receiver Jonathan Warzeka said he is hopeful this is finally Air Force’s time to beat Navy. “That’s been the feeling since I’ve been here, that we’ve been the team to beat,” Warzeka said. As a former Navy coach used to say “Show me… don’t tell me.”. GO NAVY! Beat Chair Force! 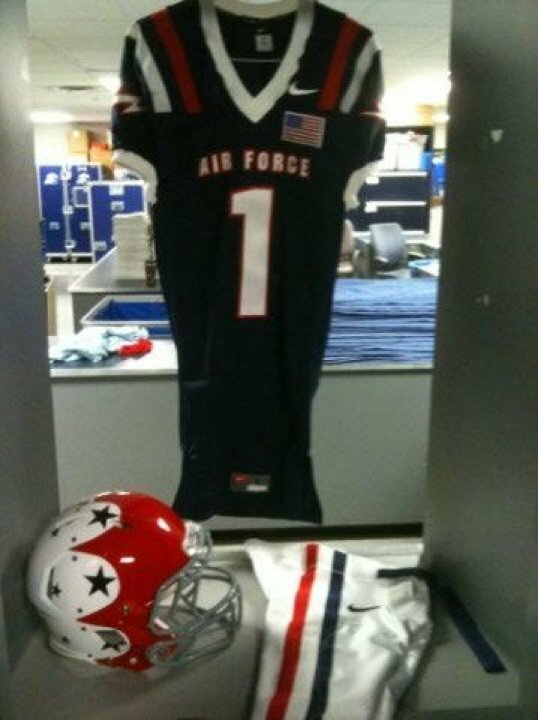 Love those special uni’s – at half time the entire USAFA team will get on a souped up Harley and jump over a Destroyer set on fire. Great analysis. I have spent the entire week figuring out the logic of AF being 10 pt overdogs. Makes no sense to me either. I read earlier in the week where an AF player remarked that AF hasn’t been beaten by Navy in recent years. Rather, AF lost the games. Arrogance, arrogance, arrogance. I think we have’em right where we want them: overconfident and wearing uniforms that look uglier than a soiled blanket from a Grateful Dead concert. Amazing. Don’t try to figure out the logic of AF being 10 pt favorites. Just take the points and bet heavily…make the bookies pay financially for their ignorance. Really glad to see the pregame this week. Great analysis, as always. Damn the perceptions, full speed ahead! Damn the perceptions, full speed ahead! I’m still waiting for them to block Tuani and Bothel. They didn’t do it last year. Navy wins sat. Thank goodness we’re not favored…. We’re rested and ready for this on! Just saw that uniform picture. The Jersey looks cool, the helmet on the other hand……Stupid in my opinion. It looks like a bunch of circus clowns designed helmets for the new Harlem Globetrotters football team. BYU looked awsum last night! Well written, and right on time before the big game Mike. Appreciate the effort here! Greg Cooper my classmate, an awesome wrester back in the day, and a outstanding individual in every sense. He was a vital cog to ensuring my son played for Navy vice the AFA. I think that another key to the game is that the Navy Special Team play –> Delahook, Buckley and the KO coverage unit need to perform as well. GO NAVY … BEAT DA ZOOMIES!!! You need the hijack that quote Bird Dog!! Too good! Yes, yes I do. Also remembered it left out his ankle, which he subsequently injured– the SI curse!